Now here’s a good one! Cut and glue the parts to make a sub sandwich! The flat bread goes on the bottom, the fixin’s in the middle, and the thick rounded bun on the top! 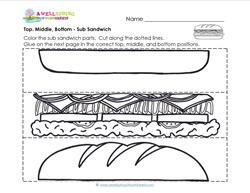 Please go to this page to see all the top, middle, bottom worksheets in this set.